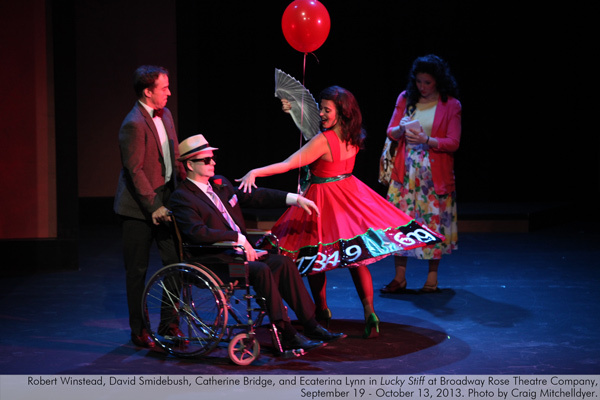 From the Tony Award-winning musical team of Lynn Ahrens and Stephen Flaherty (Ragtime, Seussical), Lucky Stiff is a zany murder mystery complete with slamming doors, mistaken identities, missing diamonds, and a corpse in a wheelchair! Unassuming English shoe salesman Harry Witherspoon is forced to take the embalmed body of his recently murdered Atlantic City uncle on a vacation to Monte Carlo. Should he succeed in passing Uncle off as alive, Harry stands to inherit $6,000,000. If not, the money goes to the Universal Dog Home of Brooklyn–or to the gun-toting wife of the casino owner! 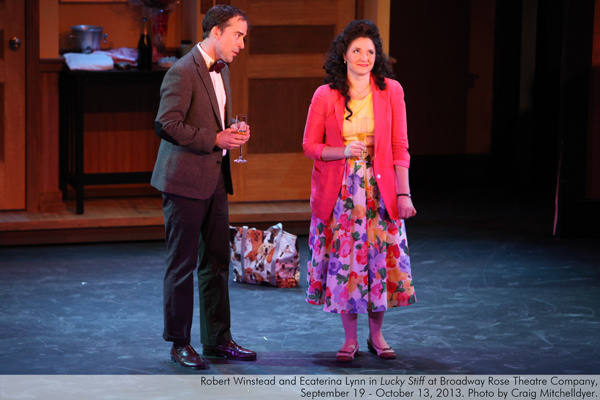 Robert Winstead is excited to be returning to Broadway Rose, last appearing as Jeff in I Love You Because. He received his bachelor’s degree in vocal music from New Mexico State University before doing some traveling which eventually landed him in Kansas City. 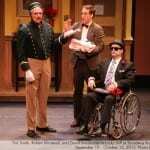 There he worked for several years with The New Theatre and Kansas City Repertory, and regularly performed improv with Full Frontal Comedy. Here in Portland he was made a few appearances in local commercials and films, and sang for two years with the Portland Symphonic Choir. Recent theater roles include Farleigh in The Scarlet Pimpernel, Scrooge as a young man in A Christmas Carol, Ko Ko in The Mikado, and The Specialist in The Who’s Tommy. 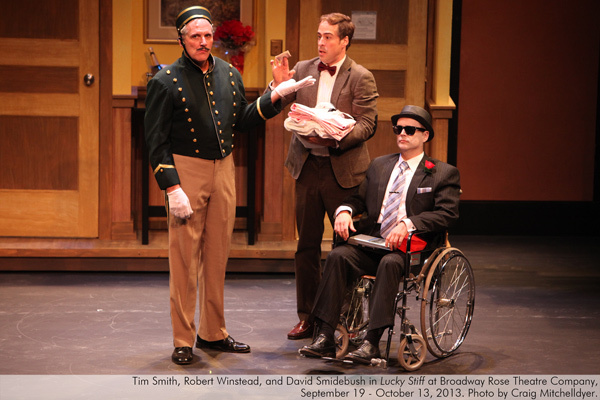 Robert salutes this fantastic cast, and is grateful to all the hard work of the staff and crew at Broadway Rose. Ecaterina Lynn, originally from Colorado, holds a bachelor’s degree in Musical Theater from Oklahoma City University and has happily settled in Portland this past year. She last appeared at Broadway Rose in Cats as Bombalurina, and was in White Christmas, Mr. President, South Pacific, and City of Angels with Lakewood Theater recently. Favorite roles include Sally Bowles in Cabaret, Bianca in Kiss Me Kate, Judy Haynes in White Christmas, and the female Bad Idea Bear in Avenue Q. Concert work includes guest solos with The Emerald City Jazz Kings, Mason Williams, Ian Whitcomb, EVAE, ECC and others. Thanks to Jim for all your support. Amy Jo Halliday starred in the National Tour of The Phantom of the Opera as Christine Daae; recent credits include Cats (Grizabella) and I Love You, You’re Perfect, Now Change with Broadway Rose Theatre Company, Paulette in Legally Blonde (Drammy Award) with Pixie Dust Productions, and Maria Callas in Ari-Maria with triangle productions! Amy Jo has been a guest soloist with the Mormon Tabernacle Choir (Music and the Spoken Word), Phoenix Symphony and Oregon Symphony (Pops & Classical series). She has been heard on national television as the singing voice for a Mountain Dew commercial. Amy Jo has a bachelor’s degree from Arizona State University and a master’s degree from Portland State University. She lives in Keizer with her darling husband and their four beautiful children. Bobby Jackson is a long-time veteran of Broadway Rose and is overjoyed to work again with such a great company. Most recently he was seen as the Jellicle leader, Old Deuteronomy in Cats. Other roles and shows through the years include the Pharaoh in Joseph and the Amazing Technicolor Dreamcoat, Combefere in Les Misérables, Evita, Cole, Bing Crosby/Danny Kaye/Lou Costello (and others) in Sisters of Swing and Christmas of Swing, Smudge in Plaid Tidings, Lord Glossop in Jekyll and Hyde, and El Gallo in The Fantasticks. 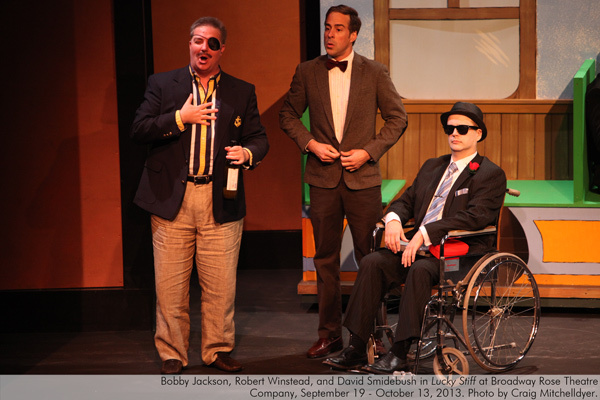 With other local theaters Bobby has been seen in City of Angels, and Curtains with Lakewood Theatre, Beauty and the Beast with Pixie Dust Productions, Sweeney Todd in Sweeney Todd at Gallery Theater, Officer Lockit in Opera Theatre Oregon’s The Beggar’s Opera, and numerous comprimario roles with Portland Opera. Bobby has also enjoyed entertaining passengers as Cruise Director and featured singer aboard the luxury riverboat, Queen of the West. As well, he has toured across America teaching drama and music to kids of all ages with the famed Missoula Children’s Theatre. 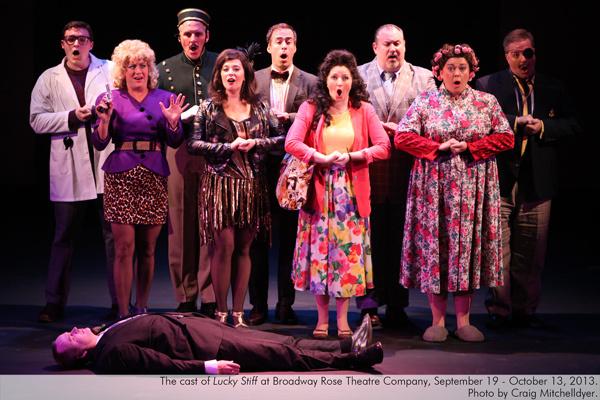 William Shindler is thrilled to make his debut at the Broadway Rose Theatre Company. A recent Seattle transplant, regional credits include: Berger in Hair, Stewpot in South Pacific, Tulsa in Gypsy, and Cliff in Cabaret. 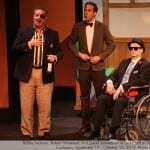 Special thanks to Dan, Alan, Meghan, and the rest of the cast and crew of Lucky Stiff. Love to my family for all their support. 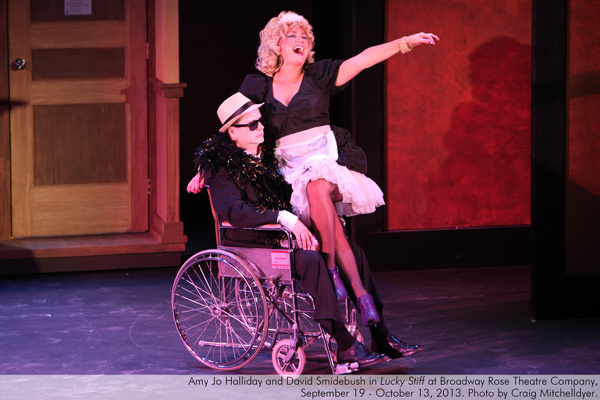 David Smidebush is very excited to return to Broadway Rose in Lucky Stiff! Over the last 30 years, David has performed with Portland and SF Bay Area production companies in White Christmas, Ripper, Joseph and the Amazing Technicolor Dreamcoat, A Chorus Line, Beauty and the Beast, Dirty Rotten Scoundrels, Crazy For You, Singin’ in the Rain, 42nd Street, La Cage Aux Folles, Anything Goes, Gypsy, The Student Prince, Hello Dolly!, Brigadoon, Me and My Girl, The Gondoliers, Oklahoma!, The Merry Widow, Good News, Die Fledermaus, Evita, Little Me, The Nutcracker, Cinderella, Coppelia, and Hansel & Gretel. An IT professional by day, he spends his free time performing, gardening, reading and cooking. Darren Hurley is glad to be returning to the main stage at Broadway Rose; his last appearance was as Mr. Mushnik in Little Shop Of Horrors. 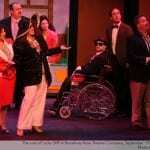 He also performed as an off-stage vocalist for Cats and in the ensembles of My Fair Lady, Ripper, and Evita. Some of Darren’s other favorite roles include Christopher Belling in Curtains, Hermann Preysing in Grand Hotel, Caleb Thorpe in Spitfire Grill, Durdles in The Mystery Of Edwin Drood, and Perkins in Ernest In Love for which he won a Drammy Award for Best Supporting Actor in a Musical. 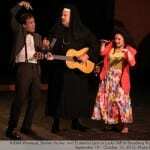 Darren has performed with Lakewood Theater Co, Musical Theater Co., and the Oregon Symphony. 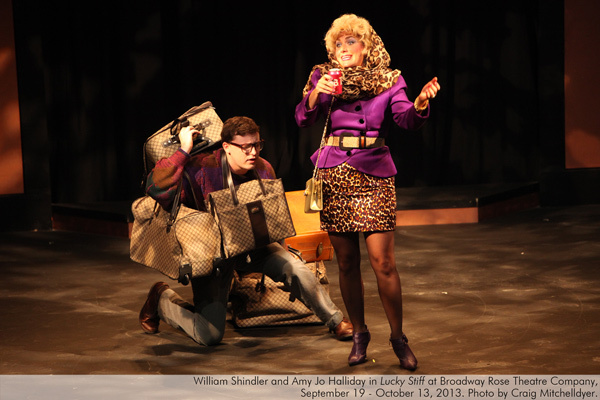 Annie Kaiser is continuing her fourteenth season with Broadway Rose (where she also works as a teacher, director, and costumer) in Lucky Stiff. Some of Annie’s favorite roles with BRTC include Veronica in The Case of the Dead Flamingo Dancer, Mama Morton in Chicago, and Kaye in The Taffetas and A Taffeta Christmas (Drammy). 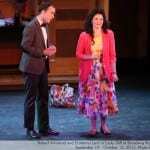 Her most recent appearance on the Portland stage has been at Lakewood Theatre, playing Martha Watson In White Christmas (OTAS). Annie received her training at University of Washington and works as the Performing Arts Coordinator at West Linn High School. 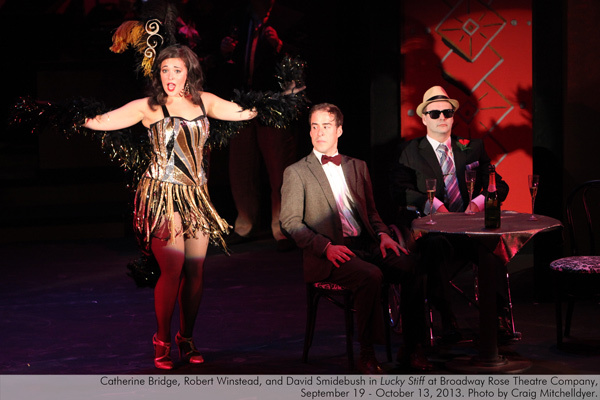 Tim Smith is making his second appearance with Broadway Rose in Lucky Stiff; having been last seen in the 2000 season as Nick in Baby. 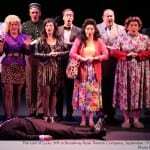 Portland credits include Sweeney Todd at Portland Center Stage; Roger Debris in The Producers (OTAS Award), Tommy in Brigadoon, Elgallo in The Fantasticks, and Emperor Joseph in Amadeus (OTAS Award) all at Lakewood Theatre. 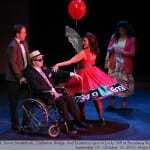 A musical theater major at the Cincinnati Conservatory of Music, Tim worked in the Chicago area for sixteen years. Favorite roles include Oscar Wilde in Gross Indecency, Boolie in Driving Miss Daisy, and The Dentist in Little Shop of Horrors, (Drammy Award: Actor in a Musical). 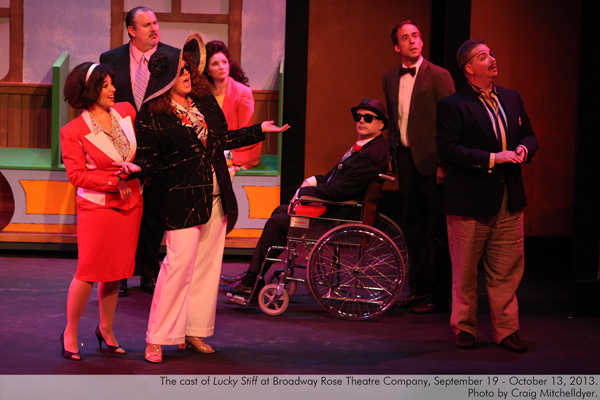 Luckily for the audience, Broadway Rose never does anything by half-measures, and the quality of this production transforms what could be two hours of formulaic fluff into a great evening of entertainment…Read more. 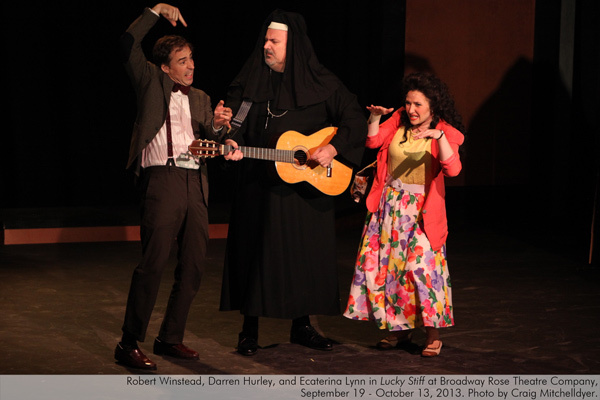 Robert Winstead could be called an accidental actor: He didn’t take singing and dancing lessons as a child, and he wasn’t a theater geek in high school, although he sang in school choirs and performed in a musical revue in eighth grade…Read more.